I know that this is the third week in a row that I’ve posted a dessert recipe. 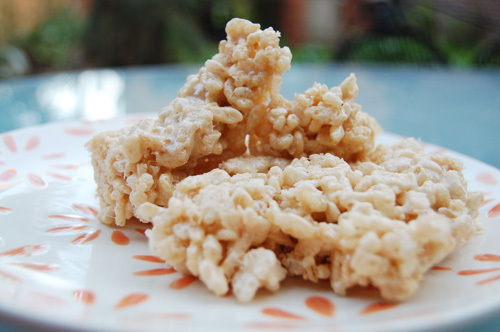 There was ice cream, and then there was pie, and now it’s puffed rice cereal coated in marshmallowy goodness. This pattern could obviously give someone the idea that all I eat are desserts. Which is not true. I just seem to have found myself in a rut. A delicious rut where I use some combination of fresh or roasted vegetables and either pasta, a tortilla, or a pizza crust and call it dinner. I don’t think (with the exception of cookout food) that we’ve eaten much lately that hasn’t had one of those bases. I’m not complaining, it’s been delicious. I just didn’t want you to think I was holding out on you. Unless, of course, you’ve never eaten huevos rancheros, in which case go! now! drop everything! Anyway the point is that while I’ve been cooking a rotation of the same style meals over and over again all summer I have been changing it up with the desserts. I’ve tried new things and recreated old favorites, I even made white sangria for the first time. It has been a delicious, albeit hot, summer. And in following that trend this weekend I made these crispy marshmallow bars for the very first time (presumably, I may have participated in their creation as a child). I’d been thinking, a lot, about the gooeyness, the crunch factor meeting with the chewy stringy melted marshmallow factor. So I set out to make them. And I failed miserably. On Saturday night we had friends and family coming over, so I thought this would be the perfect make ahead treat. And while the bars turned out well, they were more crispy than marshmallow. So the next day I tried again, and the second batch more than satisfied my craving for stringy marshmallow goodness. Through more than doubling the amount of marshmallow (silly me in the first place, I know), I got the perfect result. A touch of cinnamon and nutmeg added a pinch of something more, with the end dessert being better than my childhood memories of this old favorite. And the perfect end to a dinner of roasted peppers and eggplant over pasta. 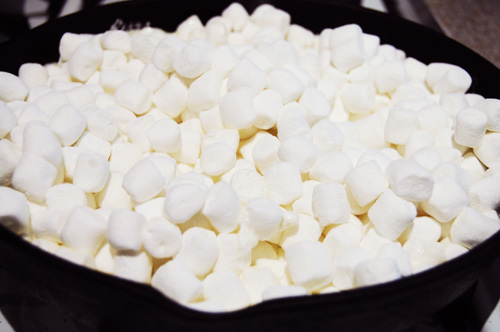 In a large skillet melt butter, sugar, and marshmallows. 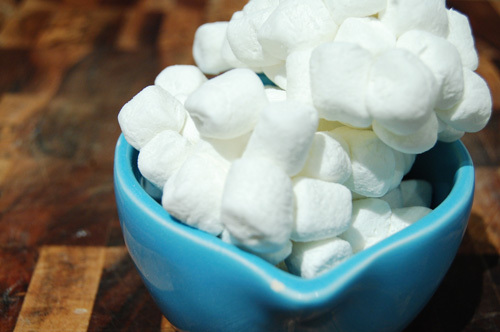 Stir frequently until the marshmallows have melted and begun toasting. Stir in the cinnamon and the cumin. 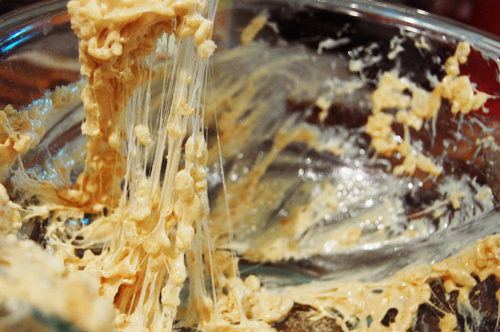 In a large bowl, combine the marshmallow mixture with the cereal. Stir so that it is integrated evenly. Line a medium size baking pan with wax paper. Scoop the mixture into the pan, pressing it into shape. Let cool at least 1 hour before serving. Well said and reasoned Jack. I will join you in doing everything I can to reverse the tide-for my kids and grandkids.